Every year Ashland, Oregon holds Oregon Shakespeare Festival (OSF) that lasts from mid-February to early November. It is an incredible experience for theater lovers. I visit every year with several friends in my book club. There are three stages in close proximity and eleven plays are produced during any given theater season. These are not only Shakespeare plays. In fact, this year, we did not watch any original Shakespeare play. My friends and I watched 4 plays in 4 days we spent there. In addition to several plays going on simultaneously, the little town also has music festivals, bands, choir, other outdoor events, salsa dancing, poetry readings and more. Small town is beautiful with tons of unique shopping opportunities and incredible eateries with some of them offering seating by the riverside. We drove from the Bay Area and spent a night at half-way point on easy 10 hour drive there. Next day we reached there early and saw one play at night and saw two more on the second day and then on the last day there we saw one play, and then started on our return journey. So we had a beautiful all girls road trip to and from the festival. Here are the four plays we saw. Homer’s Odyssey is a timeless classic but it is complex and it’s not always easy to keep the characters in mind. We attended pre-theater reading when we got a quick synopsis of the story. The play performed at open-air Allen Elizabethan Theatre was a treat of pomp and circumstance. After a decade long war, after the defeat of the Trojans by the Greeks, all surviving fighters reached home, but not Odysseus (Christopher Donahue). Odysseus languishes on a faraway island, refuses offers of love from Calypso, battles angry Poseidon’s fury, and after 20 years reunites with his wife Penelope (Kate Hurster), who was battling suitors during his absence.. This story of Odysseus known as a “story of that man skilled in all ways of contending”, according to Bill Moyers, “changes the way we see our world and ourselves”. Kudos to Scenic Designer, Daniel Ostling and Costume Designer, Mara Bluemenfeld for incredible scenes and costumes. There can’t be moviegoers who were not enthralled by the film, Shakespeare in Love. Beautiful story of young and innocent and yet deep and binding love written as a love letter to theater and theater people encompassed several contradictions beautifully. Along with cheap puns, there were Shakespearean dialogues. What’s not to love when you hear “My bounty is as boundless as the sea,. My love as deep. The more I give to thee,. The more I have, for both are infinite“? Then there was sexist politics of the time juxtaposed against the most powerful monarch in Tudor history. William DeMeritt as Shakespeare is amazing. Director, Christopher Liam Moore did an excellent job, beginning with exploration of how an artist’s mind may work when creating a brilliant work of art. Developed and directed by Robert O’Hara, Unison brings the story and life of poet August Wilson and his poetry to stage, in a unique way. August Wilson’s work depicts comic and tragic aspects of African-American experience and has inspired a huge group of poets. When meeting at his funeral, through the stories they share, a sense of reverence they have for August Wilson, reverberates on the stage. “Red blood in the river, there’ll be red blood in the river”. Adapted from the work of playwright Randy Reinholz, Off the Rails tells the story of native Americans in the 19th and early 20th centuries. Such a story would be too tragic. But instead director Bill Rauch has adapted the story as a musical and infused it with romance and humor, while also depicting the indigenous resiliency among native Americans, in the face of attempted genocide. The story is also interspersed with Shakespearean quotes like “it is excellent to have a giant’s strength but it is tyrannous to use it like a giant”. This was an excellent and heart rending play that makes one break out in laughter from time to time and yet leaves you with deep sadness. “Tell me, what is it you plan to do with your one wild and precious life?” – Mary Oliver (quoted at beginning of Part Five). If Cheryl Strayed is any inspiration, you will do much. “We aren’t poor, because we’re rich in love”, her mother said, while Strayed and her siblings were growing up. Her mother with many faults (and who isn’t), was kindhearted, forgiving, generous, naïve, and an undying optimist (when you read the book, you will see there is a pun in here, alluding to one of life’s strange ironies). One day life threw a curve ball and her family went bankrupt, at least, in love. Strayed’s memoir is a brutally honest, funny, sad, and absolutely magnificently written account of her journey through her 1,100 mile walk on the Pacific Crest Trail, through her denial and her anger, and her acceptance of things as they are, that led her to love. Wild, chosen by Oprah as her first Book Club 2.0 selection, was also chosen by Huffington Post in August 2013, as one of “40 books to read. In a desperate attempt to reclaim her life run amok with her zany behaviors, in one swell swoop, so characteristic of teens and early adults, Strayed traded the material world of possessions and comfort for life in the nature, in the wild, and in favor of her backpack, Monster, so heavy that she had to perch on a chair to lift it. At the age of 22, she began the journey at Mohave in the Sierras, in her boots so tight that her toe nails popped off. On the long journey, she held together her fraying sandals with tape, got new boots shipped by REI at next pickup location, almost stepped on the rattle snakes, came face to face with a bear and a fox, ran into the crew about to blow off the mountain she was walking on, woke up from her sleep once covered with black ants and at another time found frogs jumping over her in droves. She walked on during days of merciless heat and on bone chilling nights, got lost and then found, ran out of money and got invited for meals by kind strangers. Strayed hiked on from Mohave desert through Tehachapi Mountains to Kennedy Meadows in the high Sierras, through Forester Pass, at 13,160 feet, the highest point on the PCT, through Sierra City (a town that was wiped out by an avalanche in 1852) and other scenic villages. 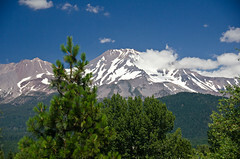 She kept walking through Northern California, where the High Sierra Nevada yield to the Southern Cascade Range, through Lassen Peak, through extremely dry Hat Creek Rim, to Mount Shasta to Oregon’s Cascade Range, through Mount McLoughlin to Mount Thielsen to Mount Mazama. 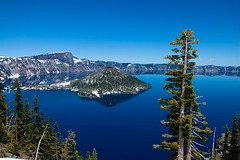 At one time, Mount Mazama had stood at 12,000 feet tall and was then hit by the crater and became Crater Lake, a site of incredible beauty, its waters so pure and deep that apparently it absorbs every color of visible light except blue, and reflects pure blue back, into the world. Srayed continued walking through the Three Sisters to Mount Washington to Three Fingered Jack to Mount Jefferson and to Mount Hood (Oregon’s largest and most active volcano), finally ending her journey at the Bridge of the Gods on the Columbia River, on the Canadian border, in the state of Washington. Yes, she did a solo two month hike and walked One Thousand and One Hundred miles! It is an incredible story of physical agony and persistence, of humanity filled with kindness, and one where only luck can help you, if in the wild, you are faced with people, with evil intentions. Throughout her journey, Strayed also reflects on her inner struggles, her deep loss, her heart wrenching grieving, her egregious behaviors that jeopardized her safety and put her marriage at risk. In the wild, she hollers, sobs, curses God, ruminates and reads. Some of her ruminations are gut-wrenching. She regrets the “small things that stung now”, where in arrogant superiority, characteristic of a teen, she had “scorned her mother’s kindness”, how she hurt her kind and infinitely forgiving husband, she yearned to talk to her siblings, yearned for a family, “to be folded into something that was safe from destruction”. Her enormous physical accomplishment pales in comparison to the place where her self healing and spiritual journey led her. About her mom she says, “the truth was, she’d been a spectacular mom”, one who gave her “all-encompassing love”, and “considered that love her greatest achievement”. She was able to forgive her step father Eddie, who was there in the most significant ways, when it mattered. At the end of her long journey, Strayed feels very present to her life, “like all lives, mysterious, irrevocable, and sacred.” (Indeed – what a profound description of life which can be seen in the rearview mirror, but can only be lived forward). Strayed is filled with gratitude, as she accepts her life, without feeling the need to recapture it. “Something inside of me released”, she says. I, highly recommend this book. You will laugh, you will cry, you will reflect, you will regret, you will accept, and most of all you will enjoy her beautiful writing. (Personally, it also reminded me of the month I spent with 4 of my fellow climbers/hikers in the Himalayan mountains, carrying our own monster packs with tents, mats, food, stove, crampons, rope, ice ax and blistered feet, and fully bathed only after the span of almost 27 days. Some day I too might write my story).